A small, but mighty, tugboat pushes a barge loaded with coal up the Ohio River, past downtown Louisville, Kentucky. These days, words like “speed,” “flexibility,” and “high-tech” describe the American culture - and a lot of the nation’s business operations. But not one that’s based on the nation’s inland rivers. 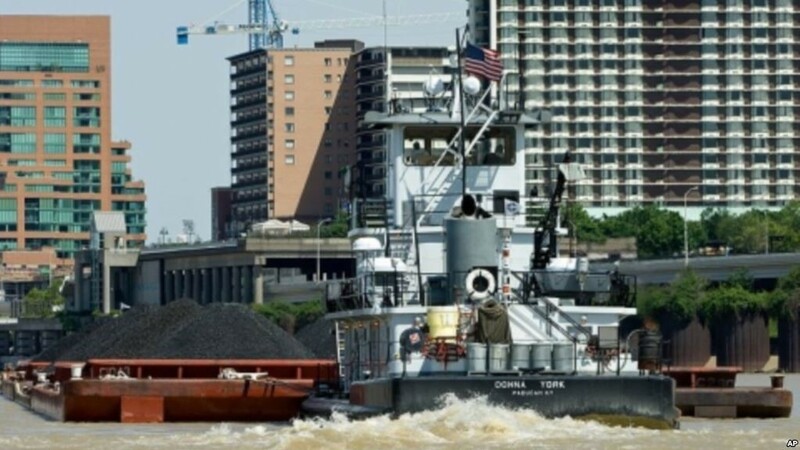 The companies that control the 21,000 barges that towboats and tugboats push and pull along big rivers such as the Mississippi, Ohio, and Tennessee in America’s midsection have none of those attributes. Barges move ever so slowly - about 9.5 kilometers [6 miles] an hour. There’s not much flexibility in what they do: the rivers are where they are, and strings of 60-meter [195-foot]-long barges get to their destination in their own sweet time. 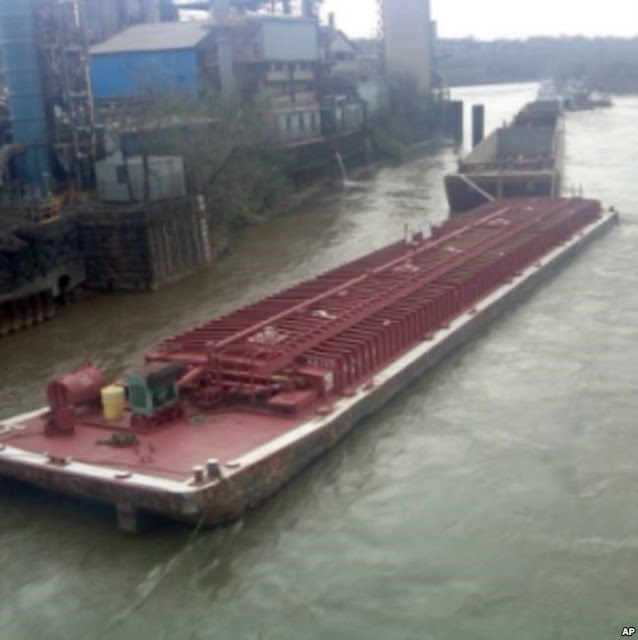 This is one of four massive barges that broke away from their towboat on the Ohio River last April. One sank. Or late, due to floods, low water, or problems that arise in the old and creaky locks along the big rivers. There’s a lot of waiting and patience involved in the barge business, in other words. About the only high-tech features involve safety on board and coordination of delivery of coal, chemicals, and grain from their source to river ports for loading. Otherwise, the barges that carry about 1,700 tons of cargo apiece - 15 times the tonnage of a rail car and 40 times more than a truck can carry - are pretty much the same as they were in the 1920s. 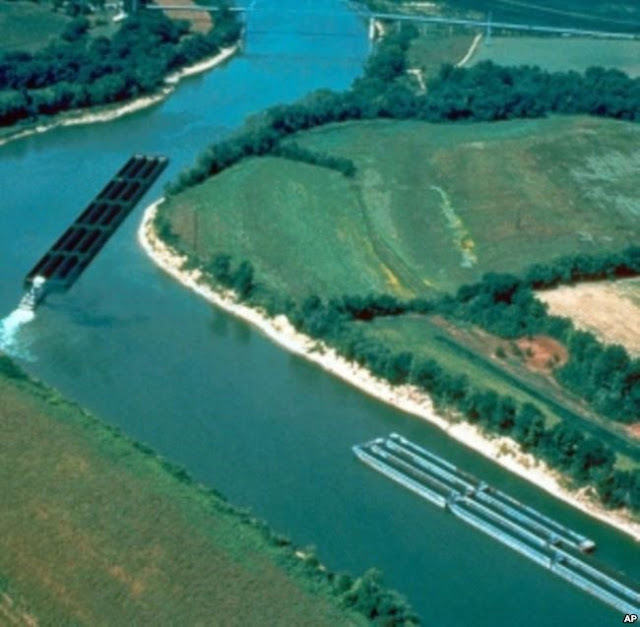 That’s when the U.S. Army Corps of Engineers began dredging America’s large inland waterways to create deep channels to accommodate barge traffic. Barges haul about five percent of the nation’s bulk tonnage, and business is relatively good. Grain production has been booming, although more and more of the nation’s corn stays put on dry land for conversion to ethanol. And the Ohio, in particular, is still jammed with coal barges feeding coal-fired power plants along the river. But lucrative traffic in containers arriving from overseas has mostly bypassed the rivers in favor of roads, despite the higher cost of trucks and trains. Why? Because, unlike barge companies and captains, container shippers and their customers are in a hurry. Some products require speedy transport but many require only that delivery be predictable. Inland waterborne transport provides that predictability and a steady delivery rate to avoid product shortages or over-supply. European waterways carry lots of container-shipping barges because of lower costs and less environmental impact. Education of shippers and adequate maintenance of waterway infrastructure are needed to gain these benefits for the USA.